Whilst in Amsterdam, Shane and I found ourselves at a sweet little vegetarian-anarchist collective. I called in the afternoon to make a reservation, as requested by their website and I asked if they had vegan options. The guy on the phone said everything was vegan, so I’m not sure why Happy Cow has it listed as vegetarian, but there it is. We arrived for dinner at the appointed 7pm, paid our 5 euro apiece (for 3 courses!) drank apple pear juice, and watched the kitchen folk scurry around for about 30ish minutes. One guy was grilling courgette slices in a pan before putting them in the oven, a gal was alternately chopping what looked like way too much parsley and flattening/decorating cookies, there was a Canadian lady tending bar, and another guy making salad dressing. It was all busy and rushing around and frantic, but happy and excited. I’d say there were about 20 people there, altogether. We queued up for spinach soup, ladled out of a 40ish quart pot and dolloped with soyogurt, selected a chunk of bread, and returned to our tables. I’m not a big spinach fan. I’m not a soyogurt fan. I am a bread fan. But it was all tasty together. I think it might have been frozen spin, but the application was quite satisfactory. Next, we watched with trepidation as salad was tossed in what looked to be a too-small container, and the loads of parsley were mixed in with another huge kettle full of some grain or other. We queued up again for our main course: salad (iceburg) with a really tasty, smooth dressing, toasted seeds and green pepper (eh), barley and rice with parsley, vegetable and bean chili, grilled courgette, and corn on the cob. It was all surprisingly delicious. I mean, I enjoyed it more than I was expecting to. I felt pretty special to be served corn on the cob, too. Let me explain. In Ireland, at the farmer’s market, you’d have to pay about 1.50 euro for ONE ear of corn. From what I saw at the health food shops, The Netherlands doesn’t fare much better. Anyway, it was good corn. Dessert was tahini cookies with peanuts on top, and walnuts mixed in the dough. Kind of crumbly, but rich and unusual tasting. On the way out, I was leaving a tip, and the gal at the bar noticed my veganism patch on my backpack, and had apparently also seen my ‘Eat like you give a damn’ shirt and my herbivore hoodie. She said ‘You are walking vegan propaganda!’ I’m not sure if it was said admiringly or scoffingly. But, it’s true. So that’s alright. That sounds like a fun experience. 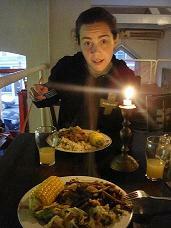 I loved finding the vegetarian Hare Krishna restuarants when we were in south america. Multi-coure, cheap and homemade. You should write a vegan foodies guide to Amsterdam and Ireland. At least for me so I can visit? Nice report! I am the guy in the picture and work for MKZ on Fridays. We used your report on a link on our website so it is a good advert! Hope you don’t mind.